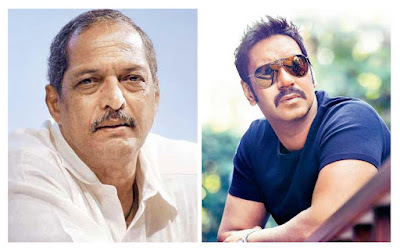 The most respected actor of 'Marathi Film Industry' "Nana Patekar" and most loved Bollywood actor by Marathi audience "Ajay Devgn" has joined hands for co-producing Marathi thriller film along with filmmaker 'Abhinav Shukla'. This will be "Ajay Devgn's" second Marathi film as producer, his first was periodic drama titled "Vitti Dandu" directed by 'Ganesh Kadam'. The upcoming untitled Nana Patekar starrer film will be directed by 'Satish Rajwade' who has previously directed Marathi thriller titled "Gair" and superhit film like "Premachi Goshta", "Mumbai Pune Mumbai" series and "Ti Saddhya Kay Karte". The story of the untitled film will revolve around lead actor which will played "Nana Patekar" and other stars from Marathi film industry will also be playing important role in the film. The Ajay Devgan and Nana Patekar co-produce film shooting will start in few months.